The Napalm Launcher (also known as the Incinerator) is a weapon in Blood and Blood II: The Chosen. 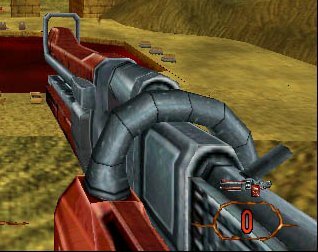 It serves the purpose of a rocket launcher seen in many first person shooter games, but the severe splash damage makes it impractical for rocket-jumping. "This monstrous weapon launches a huge ball of flaming napalm at an extremely high velocity. If the initial explosion doesn't kill your enemy, the burning probably will. Best used with extreme caution, especially in tight areas. [With the Plasma Pak] the alt-fire launches several napalm projectiles, covering a wider area but also chewing up a lot more ammo." The first possible use of the Incinerator is in the first episode, first level, in the Super Secret. Otherwise it can first be found in E1M4: Dark Carnival. "We just added the napalm cannon. It uses destructible gas cans for ammo and launches fiery missiles that leave smoke trails that do massive concussion and fire damage in a large area of effect. That was a mouthful. " "Large, heavy, and exceptionally brutal, this weapon fires flaming blasts of incendiary napalm. Activating the alt fire releases a cascading series of bouncing explosions lovingly referred to by those in the business as 'rolling thunder.' Make sure you don't set this baby off in close quarters, or you'll end up the main course in your own private weenie roast." The Napalm Launcher returns with a tighter control, but less spectacular display of pyrotechnics. This weapon is Gabriella's second weapon of choice. This page was last edited on 29 December 2017, at 18:07.